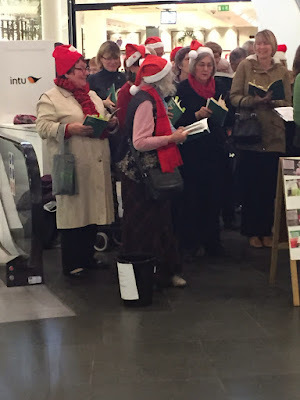 Singing Carols in Intu Uxbridge In Aid of Leukemia Research - December 2018! Starting Rehearsing Carols October 2018! This is William Ng, one of our Uxchor tenors, singing Donne e mobile and other popular classics songs at the Chinese Moon Festival (Comes in at around 3.5 minutes into the video). Performance of Haydn's Paukenmesse (Mass in Time of War)at St Margaret's Church, Uxbridge. “What a wonderful way to spend a winter’s evening: live music in the lovely setting of one of the borough’s oldest churches. And there was an extra bonus as it all happened within walking distance of home! Amersham Festival Chamber Orchestra accompanied Uxbridge Choral Society in a beautiful programme of music. 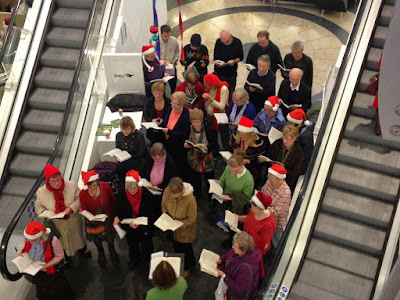 "The Uxbridge Choral Society performed their stirring version of the piece to what could, and should, have been a larger audience, fronted by an international cast of outstanding soloists. The singers ... conducted by lain Ledingham, sang flawlessly, and not only sounded good, but also looked splendid in their black and white outfits - the ladies each sporting an eye-catching red rose". "The first half was devoted to Mozart's Solemn Vespers. The opening movement, Dixit Dominus, was sung mainly by the choir, and what an excellent sound they produced. The clarity of their diction and the internal balance of their voices was excellent and the conductor's firm control of all the forces at his disposal was impressive. Part Two was devoted to the Nelson Mass by Haydn. The opening Kyrie was powerfully sung by the choir, with some clever counter-singing between the men and the women. Suddenly out of this tumult of voices emerged the soprano voice, magically dominating the 70-strong choir. It was a spine-chilling moment. This was glorious music, gloriously performed in a perfect location. What more could you want on a rainy Saturday evening?"